These kids keep us busy, and very entertained. Sean discovered self-led napping a couple of weeks ago. Once we took his crib rail off, he started laying down at random times, I think just because he was excited to be able to do it himself. 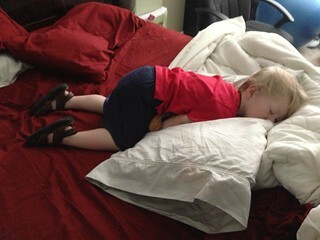 One day I found him on our bed, shoes and all. 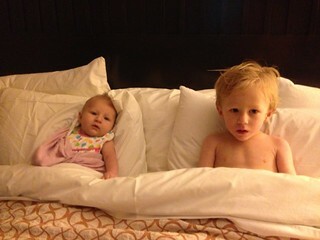 Hotel buddies! We stayed in a hotel this past weekend while visiting friends in Houston. Love her smiles and giggles. We stopped at Cooper Farms on the way back from Houston and picked up some peaches. I put some in a sack to take to our neighbor, and Sean got to carry it, but she wasn’t home. 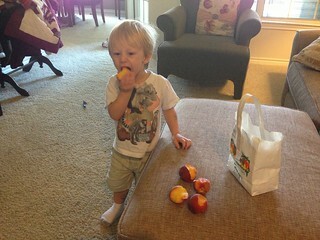 I guess he thought since he had carried it, the peaches were his. All five of them. New words every day! The past couple of days: peach, mango, manatee, try, wet, kiwi, wings, and feet.